All of those 4 or 5 or 6 or under 10 ingredient meals are so alluring. Just think, with a very few items you too can make scrumptious meals. But the ones I’ve tried end up being so blah that its easy to return to (still) simple preparations with a few more ingredients to punch up the flavors. 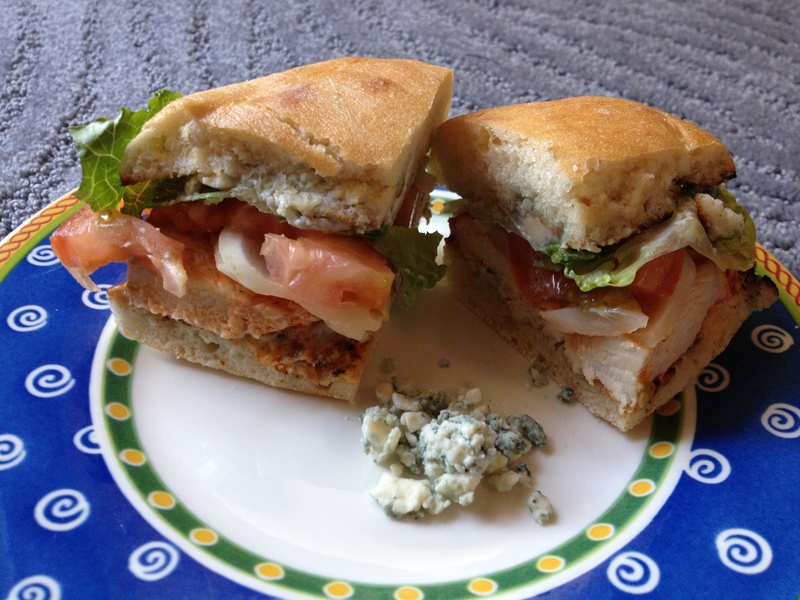 This flavorful buffalo chicken sandwich takes the cake for simple recipes with loads of flavor. 1. Combine 2 TBS hot sauce with 1 TBS softened butter, mix and set aside. 2. Combine blue cheese and lite mayo. Set aside. 3. Combine remaining hot sauce with chicken and let marinade while you start up the grill. Grill the chicken about 3 minutes per side and remove from the grill. Pour hot sauce and butter mixture over the chicken. 4. Toast ciabatta rolls lightly on the grill. 5. Schmeer blue cheese mixture on the top of each roll, then assemble sandwiches with chicken, lettuce, tomato, and onion. Lite mayonnaise tends to be a bit sweet. I’ll try this with light sour cream next time around. Our whole family loves hot wings, so the chicken was a big hit. And since each person can choose their own veggies on the sandwich, everyone gets a perfect sandwich. Every summer, when the amazing fields in the area produce the most amazing vegetables, I imagine all sorts of delicious ways to devour them. The recipes are in all of the popular magazines and newspaper food sections. But then, year after year, I find that simply grilling the veggies and not adding anything beyond the occasional splash of balsamic is really the best. No need to add cheese of this or that sort. No desire to try the lovelies in casseroles. Just grill the veggies lightly and let the natural flavors speak for themselves. Mmmmm. Until now. This recipe may sound odd. Ok, it does sound odd. Mayo on corn? But trust me on this one. 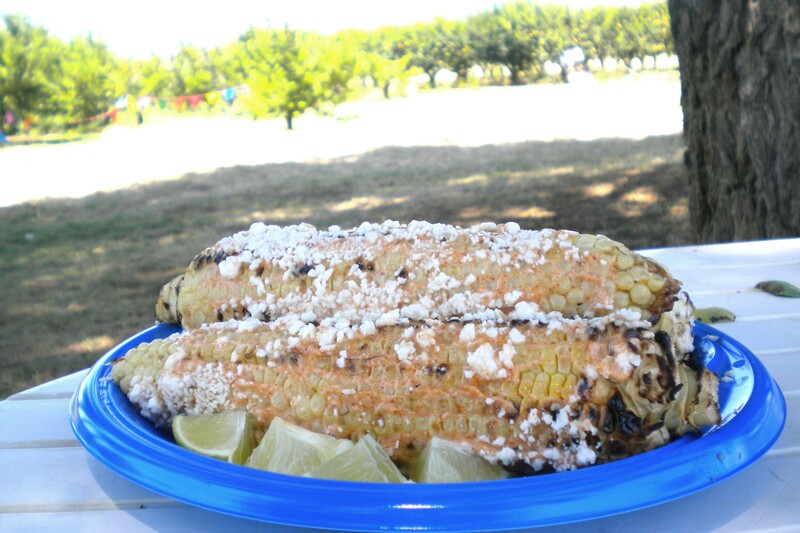 Your mouth will do the happy dance when you eat the world’s best corn on the cob concoction ever! Short version: mix first 4 ingredients, grill corn, schmear corn with mayo mix, roll in cotija cheese, serve with lime for squeezing on the corn. Stir together mayonnaise, garic, salt and cayenne until well combined. Crumble cheese onto a dinner plate. Preheat the grill to medium heat. Carefully pull back the husks of the corn, remove the silks. and pull the husks back up. Put the corn on the grill, turning every 10 minutes and moving the cobs on the grill so they each cook evenly. When the corn is cooked, about 30 minutes, remove from the grill and set aside until just cool enough to handle. Pull back the husks so they create a handle for the corn cob, using a brush or your hands, cover each cob with a light coat of the mayonnaise mixture then roll in the crumbled cheese. Serve with lime to squeeze onto the cobs. If you can get your hands on some Brentwood Sweet Corn, use that! For this photo, the corn was grilled straight on the grill. I do that whenever I need to cook quite a bit. Photo taken at Farmers’ Daughter in Brentwood, California, after delivering enough of this corn for their amazing staff. “Oh!” they proclaim. Eggs and asparagus are the absolute taste of Spring. Eggs and asparagus are the quinsential coupling of the season. “They” said so, but I had not indulged. In my world, eggs and asparagus belong in completely different groups. Asparagus is in the Prepare it Simply and Resist Any Urge to Add Anything That is Clearly Not Necessary group. Also in this group are steaks, salmon, peaches, and blueberries. Eggs are in the Salsa Always Served With This category. Other items in this group are tortilla chips, and, well, eggs. In the end, the rye bread did add a bit of oomf to this dish. The eggs are basically deviled eggs without the relish with the egg whites minced ever so sweetly. Its a nice little Sunday brunch kind of thing while totally breaking all of my previous rules. Halve eggs, put the yolks in a bowl and mince the whites. To the yolks, add the mayonnaise and dijon mustard. Mix, and fold in whites, then parsely if desired. Salt and pepper to taste. Set a pot of salted water to boil while slicing the asparagus spears into thirds. Place asparagus into boiling water for 2 minutes, drain in a collander and rinse with cold water until cool. If the spears are thick, cut each in half lengthwise. Lightly toast the bread under the broiler, then top with egg mixture and top with 2 pieces of asparagus. These are oh, so pretty. 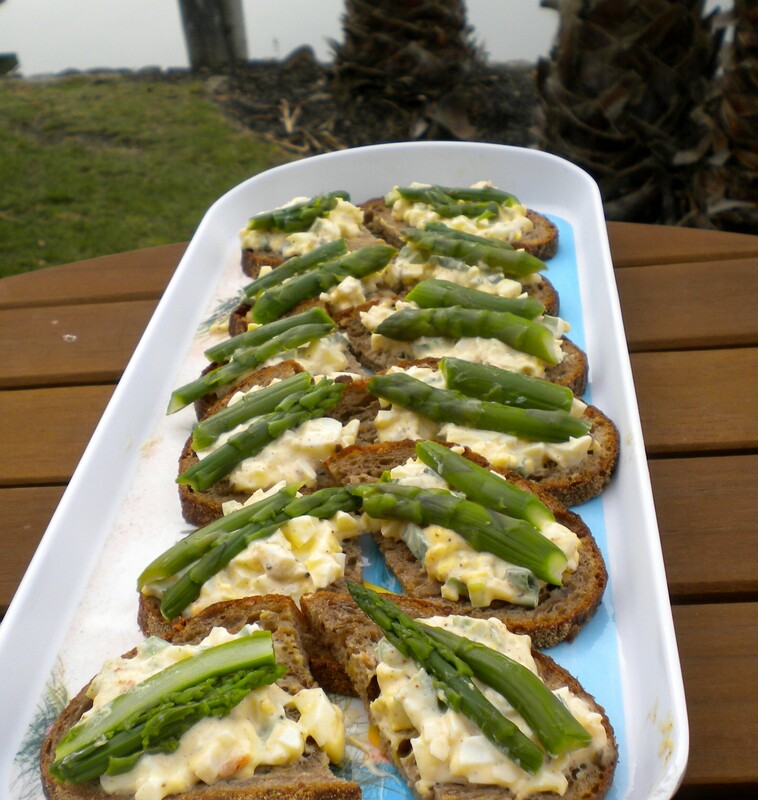 The main idea here is the egg spread, asparagus, and bread. Play with the parts as you see fit. Rye bread was one of those foods I just decided that I didn’t like as a kid. Then one day I took a personal field trip to Berkeley’s Gourmet Ghetto and had a pastrami on rye at Saul‘s. Life changing! How do you know that your sandwich totally rocks? Why, of course, by sitting down at the lunch table at work, pulling out a sandwich that is technically a left over from dinner the night before, and coworkers’ jaws dropping with jealousy. Fortunately, I work with a healthy bunch who all love a good meal. Lunch discussions are more about current events, political ideology, local foods, and our profession in general, than anything found in People magazine or at TMZ. Personally, this suits me well. Back to the sandwich. This little ditty is a breeze to make. Simply combine the marinade ingredients and sliced veggies in a zip-lock bag and leave it on the counter. Take a break from that amazing challenging task (tee-hee) while the marinade does its magic. Finally, do a quick cook in the pan, assemble, and devour. This is not the “oh my goodness, this IS spicy” kind of spicy like the grilled vegetable sandwich recipe, but rather the sweet on the front of the tongue followed by a delightful slow burn in the back of the mouth kind of spicy. Combine spices, vinegar and oil in a large zip-top plastic bag and mix together. Add zucchini, onion, bell pepper,seal and shake well to coat. Let stand 30 minutes, or refrigerate overnight. Heat a skillet over medium high heat. Coat with cooking spray. Dump the contents of the bag into the pan and cook until the vegetables are tender, about 5 minutes. Divide sauteed vegetables among 4 french bread slices. Top each with a slice of cheese. Broil until cheese softens, about 1 minute. Add remaining bread slices to the baking sheet and broil for 1 more minute or until the cheese melts and the bread browns, then lightly spread with mayonnaise. Top cheese with basil leaves and toasted bread. Feel free to be pretty flexible with the veggies in here. Any kind of squash or some eggplant would be perfect. I totally like to snack on left overs. These veggies are best in sandwiches and just don’t work well with casual “let me nibble on a few bites of zucchini” snacking style. There are just enough juices to soak into the bread, providing some extra love. 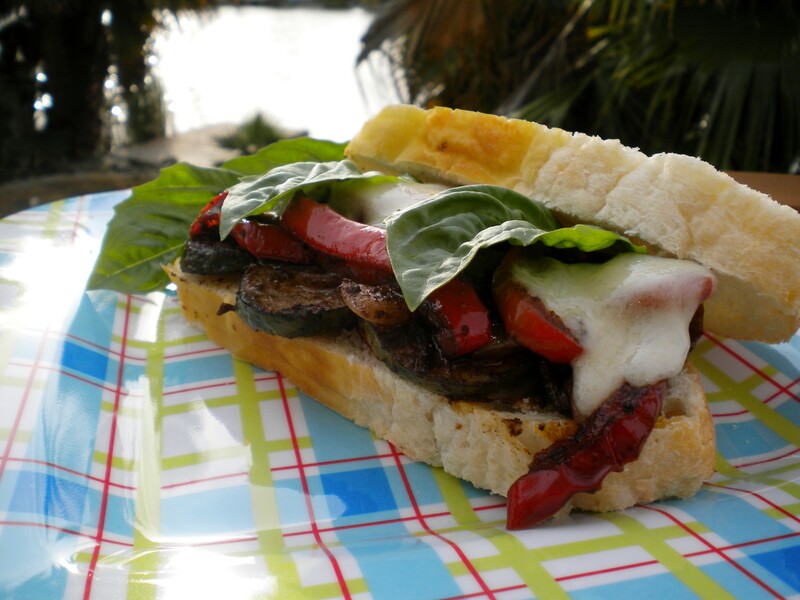 If you clicked over to the grilled vegetable sandwich, you’ll notice how much the palm trees in the back yard have grown over the years. There are 3 palms, with one of the three being a trio itself. When we bought them about 5 years ago, they all fit in the back of our SUV. Believe it or not! So, you’re out at a restaurant, perusing the menu. How do you decide what to order? I abide by a pretty simple rule: order something I don’t usually cook at home. Sometimes this is because an ingredient is just not in my pantry, such as saffron or a mixture of wild mushrooms. Other times there are ingredients just not available in the local stores such as goat or rabbit or a unique cheese. But the absolute king of all reasons to order out and not cook a dish at home is that the preparation will make my kitchen look like Armageddon arrived, twice. For that last reason, chile rellenos are a total favorite to order at restaurants. At home, I’ve made some darned good versions, but gawd, the mess makes me crazy! Those tempting casserole versions have been given a test drive, but they just didn’t satisfy the craving for the real deal. Here is a nice compromise – no deep frying, but all of the roasted poblano and cheese love. These mini chile rellenos have all of the love of roasted peppers and cheese without completely trashing the kitchen. Bueno! Slice chiles in half lengthwise and remove stems and seeds. Place chiles skin side up on a baking sheet, and broil until skins blister, about 6 minutes. Be careful not to let them burn. Remove chiles from the oven and return to the plastic bag, seal and set aside for 10 minutes. Remove and discard the skins. Heat olive oil in a small skillet over medium heat. Stir in sliced onions, and cook until soft, about 5 minutes. Add the tomatoes with the liquid and cook until onions and tomatoes achieve a sauce-like consistency, about 15 minutes. Stir occasionally. Season with cumin. To assemble the chiles rellenos: Slice cheese into 10 long rectangles (or sticks) 1/4-inch thick and approximately as long as the chiles. Roll each cheese rectangle into a chile half. 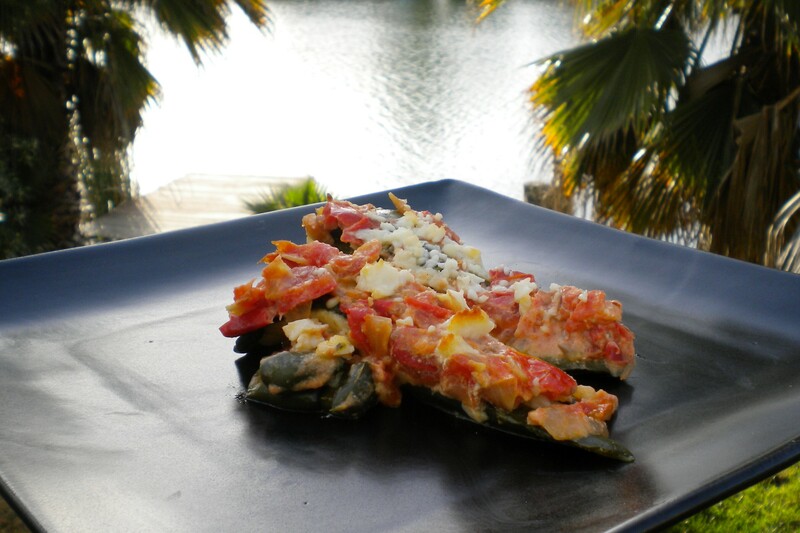 Place rolled chiles into a baking dish and top with the tomato sauce. Crumble any extra cheese on top of the sauce. Bake for 30 to 40 minutes until the sauce is bubbly. The cojita cheese holds together nicely, so these make great sides without falling apart in the pan. The cojita can easily be replaced with jack or a mixture or whatever light cheeses you need to use up. I figure that once you have the amazing taste of roasted poblanos, its tough to go wrong. Best chile relleno ever? The Chilaca at the totally amazing Blue Agave. Best food combined with the worst web site ever. Springtime. Sun, longer days, dreams of Summer bliss. All such happy, happy thoughts. See, the gods and goddesses got the lemon season totally right. Sunny yellow? Check. Tart but ready for a bit of sweet sugar? Check. A perfect transition between seasons. Yet, the gods and goddesses did manage to get a few things wrong. Limes and avocados ripe in the winter to spring months, but the tomatoes for guac in August. What in the world does that do to margarita season? Another gripe is the whole root vegetable thing in October. Here along the Pacific coast, October is sunny and warm and inviting and begs for leisurely walks to soak in the sun’s rays. Do root vegetables go with this vibe? I think not. For now, let’s get back to Springtime, and lemons, and strawberries and make a lemon pound cake and smother a thick slice with strawberries fresh from the field. We can all get on board with that plan. Coat a 10-inch tube pan with cooking spray, and dust with the breadcrumbs. Lightly spoon flour into dry measuring cups; level with a knife. Combine flour, baking soda, and salt in a bowl; stir well with a whisk. Beat the butter in a large bowl at medium speed of a mixer until light and fluffy. Gradually add the granulated sugar and lemon extract, beating until well-blended. Add eggs, 1 at a time, beating well after each addition. Add grated lemon rind and 2 tablespoons lemon juice; beat 30 seconds. Add flour mixture to sugar mixture alternately with sour cream, beating at low speed, beginning and ending with flour mixture. Spoon batter into prepared pan. Bake at 350° for 1 hour and 10 minutes or until a wooden pick inserted in center comes out clean. Cool in pan 10 minutes on a wire rack; remove from pan. Cool completely on wire rack. Combine 2 tablespoons of lemon juice and powdered sugar. Drizzle glaze over top of cake. Prepare strawberries by combining strawberries and sugar in a bowl and allowing to sit for at least 30 minutes. 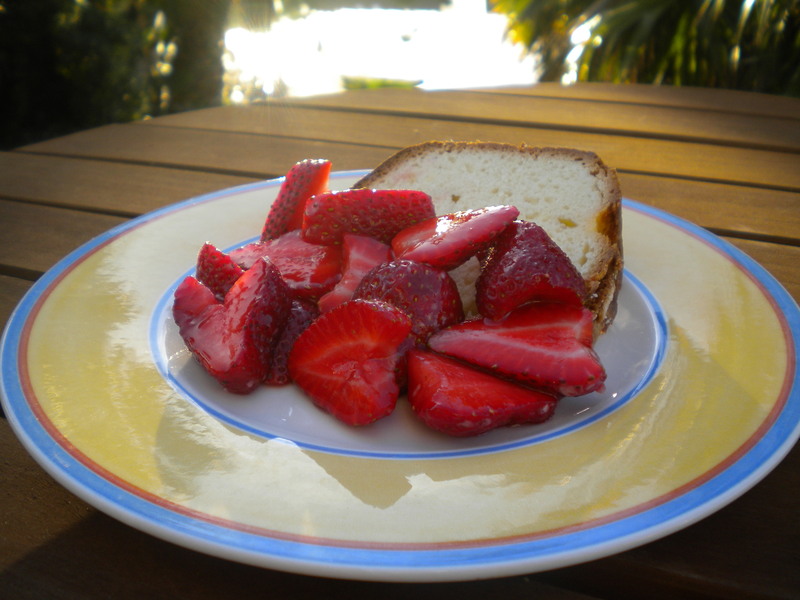 Slice lemon pound cake and top with strawberries. This is a perfect dessert for a meal you are hosting because the cake can be made a day before. Sneaking a thin slice of the pound cake for breakfast is totally acceptable. Tax day has come and gone, meaning it is time for the annual Feast. We have a lovely barter deal with our friendly CPA to prepare and file our taxes. She gives us a nifty planner to fill out each year, we add the required forms and documents, hand it to her and she does all the rest. While she certainly is honest in the preparation, she also knows how to get us every single deduction possible no matter how seemingly insignificant. Gotta love that. And in return, I make her family a feast for dinner just after tax season ends. Talk about a win-win situation! Each year I ask her what she would like, and each year she gives that awful response that cooks hate, “oh anything since everything you make is great.” Sigh, no direction there to point the way. Fortunately, her teenage son was home while I dropped off the paperwork this year, so I asked him. Bingo! He had an answer. The beef skewers with peanut sauce were a hit with him last year, so this year the meal was built around that along with shrimp and vegetable skewers. This Mediterranean orzo salad, loaded with veggies, was the perfect accompaniment. It was simple and delicious, with clear flavors that don’t overwhelm the main dish. Cook the orzo according to the package directions, omitting salt and oil. Drain and rinse with cold water. 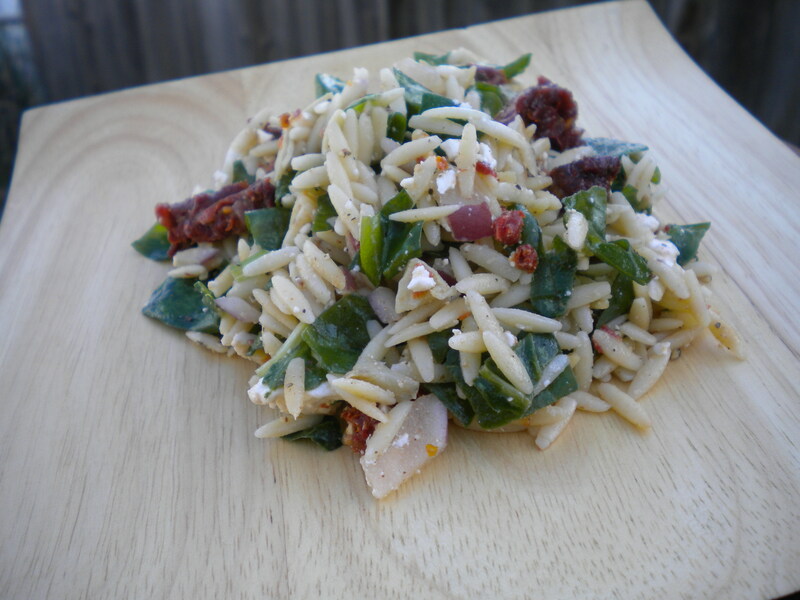 In a large bowl, combine orzo, spinach, sun-dried tomatoes, red onion, olives, salt and pepper. Prepare artichokes and vinaigrette by removing the artichokes from the jar, leaving the oil behind. Chop artichokes and add to orzo mixture. Add 1/2 of the feta cheese to the oil in the jar, put the lid back on the jar and shake to mix. Finish salad by adding feta vinaigrette to the orzo salad and tossing gently. Sprinkle with remaining feta. This was easy to double by just using a larger jar of marinated artichoke hearts. Check your grocery store’s olive bar for kalamatas so you don’t have to splurge for a whole jar. Unless they are a staple in your pantry, of course. This recipe was originally printed in Cooking Light magazine in 2005. The full menu: beef, shrimp and vegetable skewers, peanut dipping sauce, Joe’s Stone Crab sauce, Caribbean Cocktail sauce, grilled asparagus, Mediterranean Orzo salad, lemon pound cake with fresh strawberries.